Apple earlier this week announced that Toronto will be one of ten major cities in North America that will support Apple Maps transit directions on iOS 9 in the fall, but after early testing we can confirm that the new routing option for bus, subway, light rail, train and ferry directions will actually extend well beyond the city limits and TTC to cover much of the Greater Toronto Area and Southern Ontario. A thread posted on Reddit first pointed towards the Apple Maps transit acknowledgments page, which has been updated with several Canadian transit operators outside of Toronto, but we dug further and found that Apple Maps transit directions work in even more cities. We were able to receive bus, subway, light rail or train directions between over a dozen Canadian cities and towns throughout Southern Ontario listed below. Mississauga: MiWay bus directions where service is provided in Mississauga. GO Transit bus and train directions also available for traveling between Mississauga and other Apple Maps-supported cities within the Greater Toronto Area and Southern Ontario. Oakville: Oakville Transit bus directions where service is provided in Oakville. GO Transit bus and train directions also available for traveling between Oakville and other Apple Maps-supported cities within the Greater Toronto Area and Southern Ontario. Brampton: Brampton Transit bus directions where service is provided in Brampton. GO Transit bus and train directions also available for traveling between Brampton and other Apple Maps-supported cities within the Greater Toronto Area and Southern Ontario. York Region: York Region Transit (YRT) bus directions and Viva rapid transit directions where service is provided in Aurora, Markham, Newmarket, Richmond Hill, Vaughan and other areas within York Region. GO Transit bus and train directions also available for traveling between York Region and other Apple Maps-supported cities within the Greater Toronto Area and Southern Ontario. There are also directions for TTC routes operating between York Region and subway stations in Toronto. City of Hamilton: Hamilton Street Railway (HSR) bus directions where service is provided in Hamilton, Ancaster, Dundas and Stoney Creek. GO Transit bus and train directions also available for traveling between Hamilton and other Apple Maps-supported cities within the Greater Toronto Area and Southern Ontario. Kitchener-Waterloo-Cambridge: Grand River Transit (GRT) bus directions where service is provided in Kitchener, Waterloo and Cambridge. 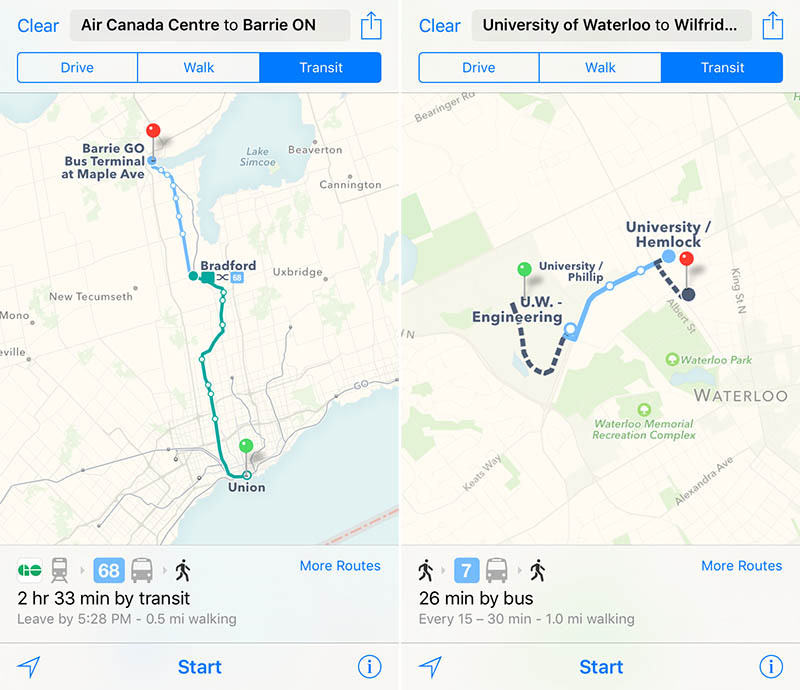 GO Transit bus and train directions where service is provided for traveling between Kitchener-Waterloo-Cambridge and other Apple Maps-supported cities within the Greater Toronto Area and Southern Ontario. Guelph: Guelph Transit bus directions where service is provided in Guelph. GO Transit bus and train directions also available for traveling between Guelph and other Apple Maps-supported cities within the Greater Toronto Area and Southern Ontario. Niagara Region: Niagara Falls Transit, St. Catharines Transit, Welland Transit, Niagara Region Transit and WEGO bus directions where service is provided in Niagara Falls, St. Catharines, Welland and Niagara Region. GO Transit bus and train (summer only) directions where service is provided for traveling between Niagara Falls and other Apple Maps-supported cities within the Greater Toronto Area and Southern Ontario. Apple Maps will automatically provide with you the proper connection or transfer details when traveling through multiple cities. For example, traveling from Air Canada Centre in Toronto to Fallsview Casino in Niagara Falls may require transferring from a GO train to Burlington Transit bus to a GO bus, and Apple Maps will figure out the most efficient route for commuting to and from your destination. Apple Maps transit directions will also be available in Baltimore, Berlin, Chicago, London, Mexico City, New York, Philadelphia, San Francisco and Washington D.C. when iOS 9 launches this fall. Presumably, transit directions may also be available in the metropolitan areas and surrounding regions of many of those cities as well, and more regions in the future as Apple secures more partnerships with transit operators.